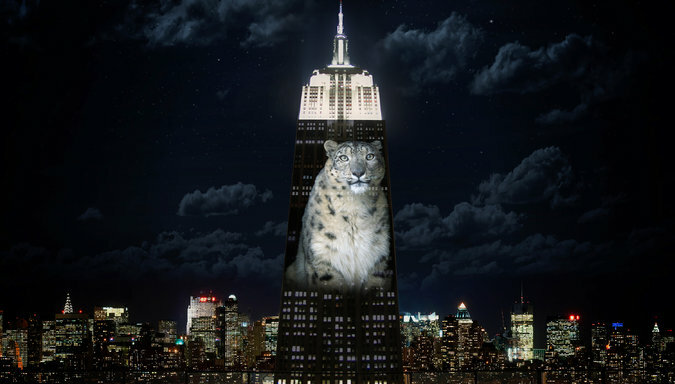 A representation of a snow leopard projected on the Empire State Building, an image that is to become a reality as part of the event “Projecting Change: The Empire State Building,” about endangered species. New York Times photo by Joel Sartore. A planned outdoor light projection event this Saturday, August 1, will bathe New York City’s iconic Empire State Building in 800,000 lumens of light showing images of endangered species from around the world. The creators of the event (“Projecting Change: The Empire State Building”) refer to the light show as a “weapon of mass instruction” they hope will raise awareness of the plight of animals like snow leopards and manta rays. The $1 million project would be the first instance of moving images projected on the side of the famous building known for its already bright night lighting. “Projecting Change” is not only an irresponsible effort on the part of its creators, but also a disappointment from the Empire State Building. Its owners have become increasingly audacious in their displays lighting up the building in recent years, and a successful event this Saturday will embolden them and others to tolerate and even encourage more such displays in the future. While the projections will take place over only a few hours, they may ultimately have environmental impacts lasting for many years. You can help make a difference by sending a clear message opposing this event. Call, email or fax the office of the Empire State Building General Manager, Joseph Bellina, and tell him to head off this environmental catastrophe before it begins at 9 p.m. this Saturday night. At the same time we were encouraging you to take action we also wrote a letter to the editor for the New York Times. It was published on Tuesday, August 18. You can read it here.